STRATFORD — Jennifer Mattei crouched down along the low-tide shoreline at Stratford Point to scoop up a mound of inky gray sediment in the palm of her hand. It is proof, the Sacred Heart University biology professor said, that her Reef Balls are working. 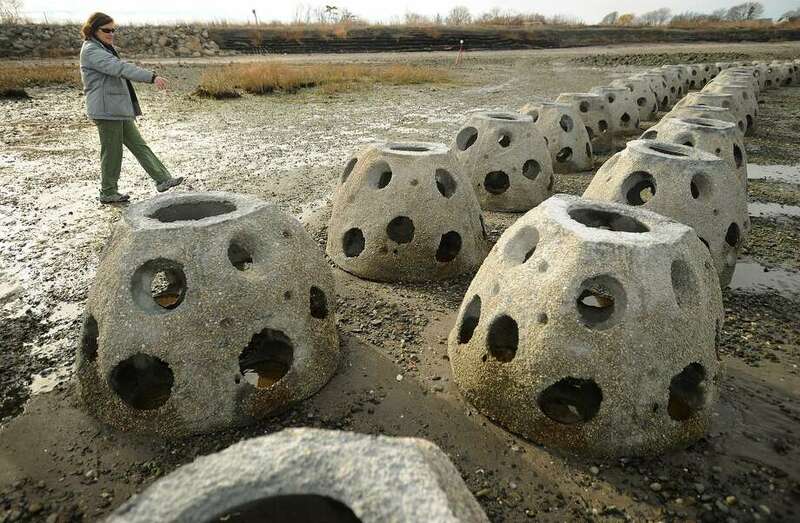 Meandering rows of the thousand-pound dome-shaped cement balls create an artificial reef. Each ball is punctuated with holes that allow the tide and small sea creatures through. Over the past couple years the reef, planted just off shore, has begun to not only stop erosion but reverse it. It is estimated that sediment, up to four feet deep and 100 feet wide has disappeared along that swath of shoreline over the past three decades. The property is now owned by the DuPont Corporation and managed by the Audubon Society. So far, surveyors periodically measuring the terrain estimate sediment about 12 inches thick has re-accumulated over the past two years behind the barrier — enough for Mattei to win another $115,198 grant to expand her work. The just announced National Fish and Wildlife Foundation’s Long Island Sound Futures Fund grant will be used this summer, with the aid of a team of Sacred Heart students, to plant thousands of marsh grass plugs into the shore line upland from the barrier. The pilot study began with 64 Reef Balls. This November, another 327 were added with the help of DuPont and the Army Corps of Engineers. Mattei checks on them periodically, searching for signs of algae, barnacles and any oysters who now call them home. 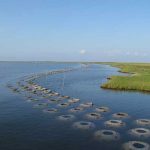 Reefs made of clinging oysters used to protect the shoreline. They disappeared centuries ago. It was the oysters, the horseshoe crabs, the piping clover and all other habitat, Mattei admits, who got her into this kind of research. Those creatures depend on the shoreline and their access has been compromised by decades of beach erosion and climate change. “The ocean floor is rising. Storm frequency is increasing. Global climate change is real,” Mattei said. Although used worldwide, Mattei is believed to be the only one to use them in Connecticut. Scientists like Juliana Barrett, with the University of Connecticut Center for Land Use Education and Research hopes that will soon change. In addition to rebuilding dunes and salt marsh grass, Mattei said she also has her eye on sediment expected to be dredged next fall from the nearby boat channel at the mouth of the Housatonic River, which is on the opposite end of Stratford’s beach front.